Just hours after canceling “International Burn A Quran Day,” the Florida church behind the controversial event said Thursday it could move forward with its original plan if the deal it thought it struck turns out to be non-existent. 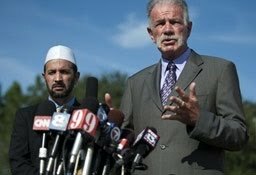 Earlier in the day, the church’s head pastor, Terry Jones, told members of the press that he and his church would consider it “a sign from God” to cancel the burning if the group behind the proposed Islamic center and mosque near the World Trade Center site were to cancel or move its facility to another location. “The American people do not want the mosque there. And of course Moslems do not want us to burn the Quran,” Jones explained Thursday, tying together the two controversial plans. In response, Jones said he and members of his church agreed to cancel Saturday’s burning. “We are committed to dissolving the situation here and there,” said Imam Muhammad Musri, who reportedly mediated communication between Jones and Rauf’s office. Notably, however, while Jones spoke of an agreement to move the Islamic center, Musri only said during the press conference that there was “a commitment” for a meeting between Jones and Rauf. Following the press conference, however, Park51, the group behind the proposed Islamic center, refuted reports on the alleged agreement, noting that Rauf “hasn’t” agreed to moving the $100 million, 13-story facility. “It is untrue that Park51 is being moved,” reported the team behind the Muslim-led project in its official Twitter account. “The project is moving ahead as planned. What is being reported in the media is false,” it added. Shortly after, Rauf released his own statement saying he was “glad” that Jones decided not to burn any copies of the Quran. But he also said he has not spoken to Jones or to Musri. “I am surprised by their announcement,” Rauf reported. “We are not going to toy with our religion or any other. Nor are we going to barter. We are here to extend our hands to build peace and harmony,” he added, effectively taking away what many thought to be the conclusion of a monthslong controversy. Jones also said his church was taking the concerns of Gen. David Petraeus “very seriously,” though he still vowed to move forward even after hearing remarks from the top U.S. military commander in Afghanistan. With just two days before the scheduled burning, the announcement of the event’s cancellation Thursday arrived as a relief to many as the plans alone had already incited Muslim protests in various parts of the world. And, as Musri noted during the press conference, the decision to cancel the burning was made at an opportune time as it was arrived just hours before Muslims around the world begin marking the end of their holy month of Ramadan. “Hundreds of millions of people would be listening to sermons. And the messages that would have dominated the sermons would have been the burning of the Quran in the United States,” Musri noted. The burning was originally set to take place Saturday from 6 p.m. to 9 p.m. Saturday marks the ninth anniversary of the 9/11 terror attacks that left nearly 3,000 dead and over 6,000 injured.